As you can see it is used mainly on debuggers during development process. But debuggers are also used during advanced dynamic malware analysis. It is true that malwares in order to avoid being traced by debuggers, use ptrace system call. By properly executing ptrace malwares can detect the "tracer" process (e.g. debuggers, ltrace, strace). The first three lines is the prologue of the certain assembly subroutine, nothing interesting. The ptrace system call takes place in the last four lines. At first, eax and ebx registers are wiped out and then the value 1A(hex)=26(dec) are passed to al (which is the lower 8 bits of eax register). After that an interrupt is made in order to transfer execution from user to kernel mode . But what's the purpose of moving the value 1A(hex) to al? Digging the linux system call table, i realized that in order to execute ptrace the value 26(dec) should be present on eax! Bing! This explains why "mov al, 1Ah" was executed. Regarding calling conventions, i also noticed that this piece of assembly code is not the appropriate way that gcc compiler translates C code to assembly. The gcc usually uses stack in order to pass arguments and call functions. So this piece of code is a inline assembly addition often used in C.
Assembly code can be added in C code using a function. 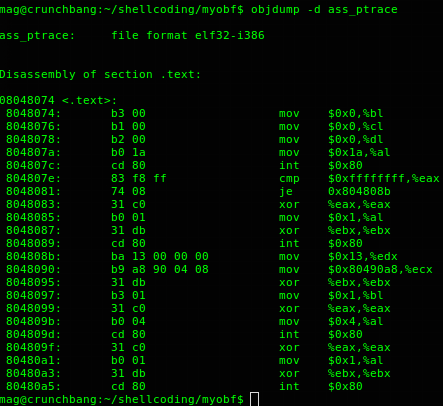 In this case named insert_assembly(). If ptrace's return value is -1 then the process will be traced by a "tracer". In that way, the malware can detect its tracer and follow a different code path. Briefly, this assembly code executes ptrace(PTRACE_TRACEME, 0, 0, 0) and according to the result it exits or it prints a message and then exits. It prints the message every time it detects a tracer. As you can see when ass_ptrace is executed without a tracer it does nothing and exits. But when i try to trace it using strace system command, it detects strace, prints "Debugger detected!\n" and exits with the same exit code (0). 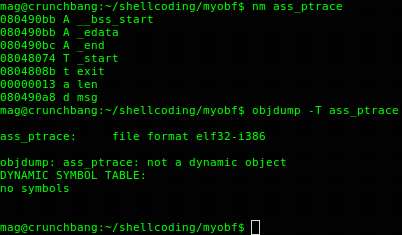 The interesting thing despite of the detection of ptrace system call using strace is that ptrace doesn't exist on symbols' table even if i never stripped ass_ptrace (strip removes unnecessary symbols from an ELF, in this case "strip ass_ptrace"). Combining this technique (calling ptrace in this way using assembly and importing it to C code) with some kind of obfuscation can make things nasty. Obfuscation techniques will be discussed in another post. It is not my intent to train new bad guys, but to make people (particularly security guys) aware of techniques used by them. Feel free to post your comment. Have a nice day!